Triggered emails, also known as behavioral emails or transactional emails, are those sent automatically based on pre-defined events or conditions met by an individual through certain behaviors, actions, or other signals. The primary distinction between triggered emails and general promotional emails is that triggered emails are automatically delivered to an individual on a one-to-one basis, while promotional emails are manually sent on a one-to-many basis (where many people are sent the same email at the same time). Triggered emails are incredibly powerful tools in email marketing because they are both timely and relevant, providing the recipient with actual value and usefulness. According to Forrester Research, triggered emails generate 4x more revenue and 18x greater profit than regular emails. Additionally, triggered emails have been found to contribute over 30% of overall email revenue (DMA). An event triggered e-mail is a personal email message that is sent to a subscriber based on an event. Because the actual trigger event for these emails can be based on a wide variety of customer data, it’s incredibly important to employ a unified marketing platform where your email tools can access the available data across the rest of your marketing stack. This enables triggered emails to be sent according to website activity purchases from a mobile app, or any other data found in within your respective marketing stack. 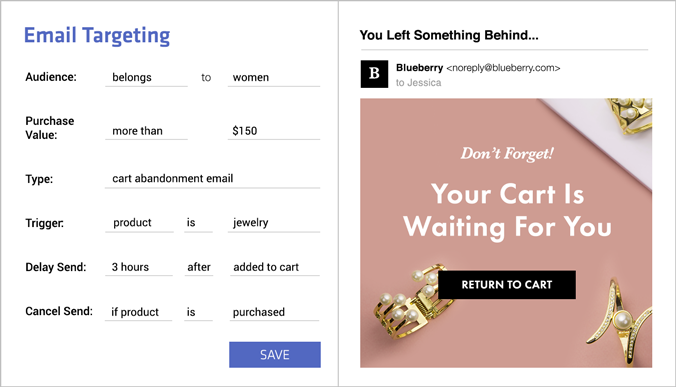 Product View Abandonment – If a customer browses a particular item on a mobile app but ultimately doesn’t purchase it, a triggered email highlighting the viewed product (and other recommended items) would re-engage them after exiting the mobile app. Cart Abandonment – Shopping cart abandonment is a serious issue for many eCommerce businesses where a customer adds items to their shopping cart but leaves without completing a purchase. You can trigger a cart abandonment email to try and recover them to complete their checkout process. Order Confirmation – Order confirmation emails are sent after a customer’s purchase order is confirmed and finalized. Set the email trigger upon purchase completion and deliver order information, relevant shipping details, and more. With triggered emails, businesses can engage their customers with the right message at the right time to provide a great customer experience.